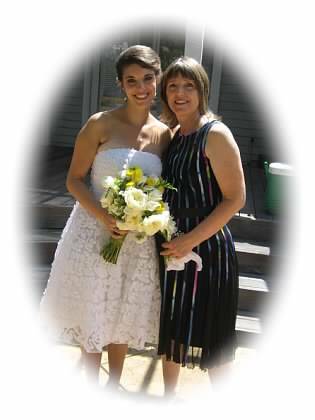 While I have been absent here, I have been a very busy Mother of the Bride this past month in preparation of our daughter Susannah’s wedding last Sunday in our backyard. What a beautiful, memorable day~a living poem! After all the guests have departed-to Ireland, New York, Texas- I am settling back into a few slow days to reflect and get back up to speed. Enjoy the weekend, the lovely summer days, and we’ll get back down to poetry business before long. Promise. Congratulations to your daughter’s wedding and best wishes to the couple. The picture, to me, shows to happy and lovely ladies. Take your rest as I am sure it is well-deserved. Such a wonderful photo of you and your daughter on such a wonderful occasion. Enjoy the respite. I am so happy for all of you. Do take a well deserved rest. You both look radiant in the photo. Your daughter makes a beautiful bride, and her mother is right there with her. Congratulations to you both. Nice to take a little time out after the wedding; I’m sure you were a bit busy beforehand. I love the subject line as the title of a poem , and of course there would be no wedding (oranges) in it. Yes! I think I will write just that poem. Thanks for the idea, the thoughts, and good luck in Missouri! Aw, thanks for everyone’s enthusiasm. I’m still aglow! Congratulations to the happy couple and parents all. Your gorgeous back yard must have been the most perfect setting. What a lovely daughter you have Sally, and congratulations Mom!! I can’t believe I haven’t visited this site in some time…but have enjoyed your posts…Looking forward to your reading this evening at Willow Glen.